Annotation Edit 1.9.99.20 is available now. Annotation Edit is now the first subtitle editing app to directly support editable subtitles with Adobe Premiere Pro CC Essential Graphics titles via Final Cut XML. Annotation Edit includes extended support for Final Cut Pro X 10.2 or later. Since Version 1.9.29 a free Scene Detection utility is included. This update still remains free. zeitAnker Annotation Edit gives you a sophisticated interface to attribute and subtitle video or audio in very short time. Therefore we developed techniques hardly found elsewhere and took the chance to build a clean and extensible product from scratch. 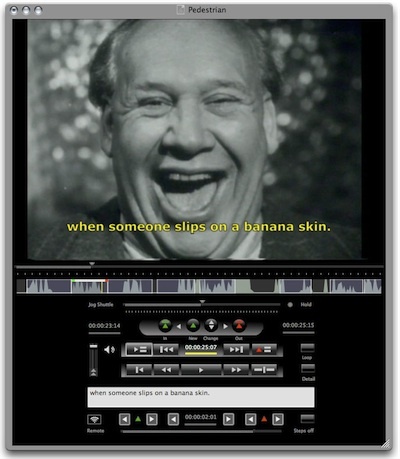 Two videos showing creation of QuickTime movies with closed captions or subtitles are added to the services. Two videos showing integration with Final Cut Studio. Refine your Quick Spotting right in the waveform time-line. Drag ends while listening to the audio track. Redraw, add or delete spottings. The example is taken from an historic noisy movie, printed to tape with black right border. If you want ro see the whole movie with German subtitles here it is. The complete video for download can be found at archive.org Pedestrian Crossing. We will be happy to add your translations or closed caprions. SCC import and export, transcript import, DVD Studio Pro track item description import. Italic style, alignment and position can be imported from and exported to SCC, FCP XML, DVD Studio Pro STL and EBU STL. RTF export. FCP XML export with fades. Reads native time-code offset. Support for Apple Remote Control. Annotation Edit 1.2.1 introduced a new feature "Quick Spotting". Let us call it "instant spotting". In most of cases this feature will save you vast amounts of spotting time. Just have a look here at this movie. No tricks, all takes are done in real-time, showing instant spottings from several mixed-down sources, including a full-length feature film. Annotation Edit Version 1.3 focusses on transcripts and file exchange with external translators. Now included are MS Excel XML import and export. RTF with time-code import and export. MS Excel XML may include time-code offset information, as well as some logging notes. Plain text, Plain RTF, MS Word doc, html can be imported with automatic duration calculation. A new fast logging mode has been added to quickly assign time-code to transcripts. No arenaline based live spotting, relax hit fast logging when the subtitle should disappear. Annotation Edit will try to set the corresponding start - by words per minute calculation. If just need to feed in translations, you can feed in plain text documents and let Annotation Edit apply the time-code and styles from your spotted master track. Or apply Instant spotting to transcripts, just prepare the transcript with corresponding line delimiters. New snap functions to reposition the start or end of a subtitle to the current time. If you need to bring in frame-based time-code, the new time-remapping functions will help you. DVD Studio Pro and EBU STL can write the native time-code to STL. No need for offsetting by hand before export. Multiple illegal time-code values, overlaps, duration and text length errors can be found and often even fixed with one click. Hard wrap long lines to apply to the technical specification of captions. All proceesing features are greatly enhanced. A free test-drive of our new Blu-ray plugin is included. The waveform is automatically normalized. Here we use waveform overdrive leverage the waveform rendering. Quick spotting will detect even the finest details. Concentrate on your work, share, distribute and refine your work at any time and any place. Circumvent costly production environments. Create teleprompter files for use with Apple Logic or Digidesign ProTools on the fly. When it comes to video annoation and subtitling, two interface models are common. Even thousands of annotation entries are managed in a very convenient way and more important almost instantly.